When I showed you my room the other day, you might have noticed the huge white space above the cabinets. As soon as I can manage to get a ladder in my room, I plan on decorating it with students’ names. I got this terrific idea from Molly at Lessons with Laughter, although I think hers turned out cuter. Cut white construction paper in half, and then trim an inch off of the side and the top. Write out students’ first names in bubble letters. Next time I’ll use a thicker Sharpie. Let them decorate to their heart’s content. Cut long construction paper in half and glue it on as backing. This was one of those great activities that kids can work on when their work is finished at the beginning of the school year, and I love how I could already tell something about their personalities from just this one activity alone! 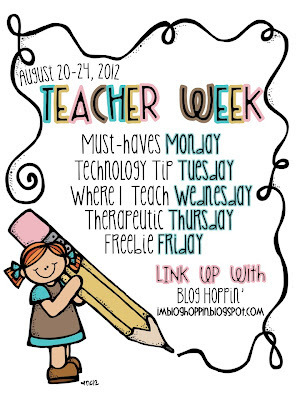 If you try this easy back-to-school activity, please make sure you check out my inspiration here! Not too talented with bubble letters? WordArt will work for these name posters, too! As a side note... thinking about moving my freebies over to a TpT or TN account. I'm just getting discouraged with spending lots of time on a post and freebie, seeing it get lots of traffic, but getting hardly any comments. I know that people won't leave feedback on TpT/ TN much more, but at least it would tell me how many people downloaded. I've also been making some custom lesson plans for people, and when they are satisfied, I need to be able to charge them. I'm trying to look into the benefits of TN vs. TpT vs. a separate PayPal account. I would probably rather set up a store in case I want to sell other things later, but I'm debating TN vs. TpT. It sounds like TN is the better deal per product (and pays immediately), but TpT tends to get more traffic and therefore more sales. Am I right?